Looking for a tasty new way to use those end-of-the-season green tomatoes from your garden? Try this quick and easy Green Tomato Pie recipe. It's a simply sweet way to extend their fresh-picked flavor and continue to share your garden's bounty with the people you love. Preheat oven to 400°F. Place the first crust in pie pan. Combine sugar, flour, tomatoes and vinegar, and fill the crust with the mixture. Dot the pie mixture filling with butter. Top pie with the second crust. 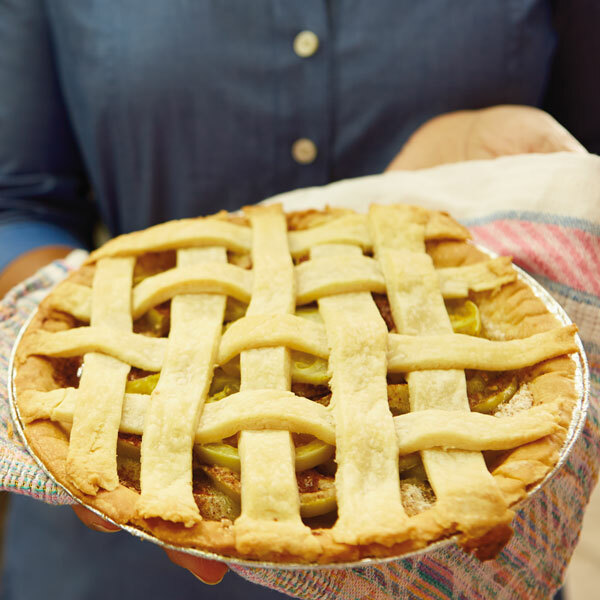 (If you want to make a lattice top like the one pictured, cut a second crust into strips and weave them atop the pie.) Sprinkle with sugar and cinnamon. Bake for 15 minutes. Then reduce heat to 350°F, and bake an additional 35 minutes.